This is a sale for a brand new genuine Honda Civic B16A B16B Integra Type R B18C Mainshaft 3rd Gear from Honda Motors, Japan. It will fit the JDM Integra Type R 98+ S80 4.785 Final Drive Ratio Transmission and 92-00 Civic SiR Y21 S4C Type R S4C 4.4 Final Drive Ratio Transmission. 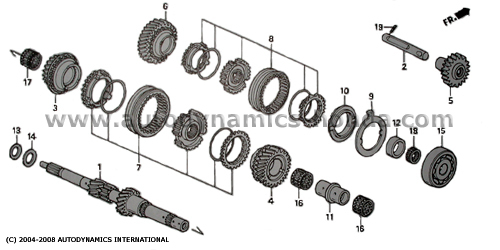 This mainshaft 3rd gear (No.3 in the B-series DOHC VTEC hydraulic transmission mainshaft components diagram below) is located next to the sleeve set synchronizer 3rd-4th. As application is very wide, buyers please check that this part number mainshaft 3rd gear matches with your requirements. Buyers may also check with us if uncertain of application.